One of my daughters woke up with a scratchy throat recently. It was the kind that made me think it may just be allergies or sinus drainage so I kept an eye on her but didn’t worry much about it. On day three, however, she woke up with her throat hurting so badly that she could hardly swallow and didn’t want breakfast because it hurt too bad to eat. I realized I needed to get the big guns out and start her on Dr. Christopher’s Strep Blend! Strep throat is one of those things that you can’t diagnose for sure without a test at the doctor’s office. There are other infections that can cause the throat to hurt so baldy that you think it must be strep and yet it isn’t. So no, I didn’t know for sure that my daughter had strep throat, but I knew we had recently come into contact with people that came down with strep, so it was a possibility. The good news is that natural remedies are safe to use no matter what the condition may be – you don’t have to have a specific diagnosis to treat it. 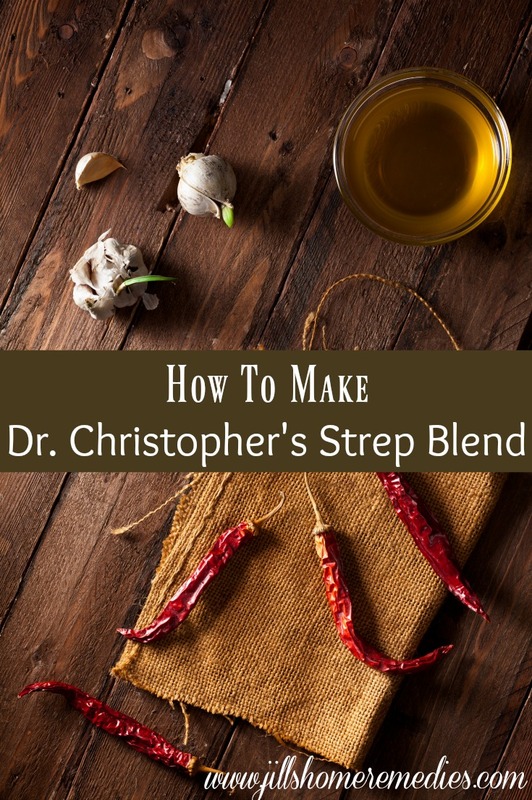 This Strep Blend can be used to boost the immune system and kill infections and viruses of all kinds. Take note that strep throat is one of those illnesses that CAN be dangerous if you don’t treat it. If left untreated, there is a possibility of rheumatic fever developing. Treat your children immediately when they are sick, and it’s always a good idea to get them checked out at the doctor if you suspect strep to make sure your home remedy successfully treated it. 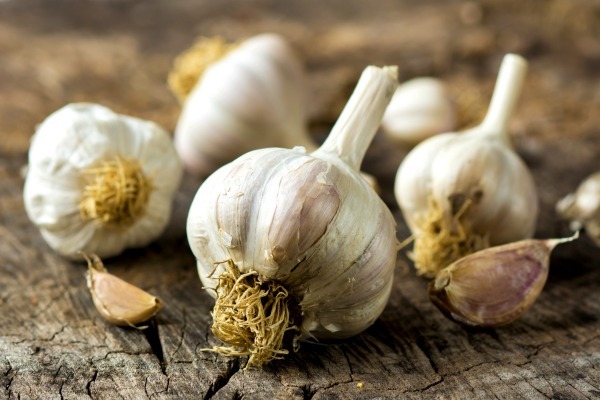 This strep throat blend contains garlic, which is a powerful natural antibiotic! It has broad-spectrum antimicrobial activity against bacteria and fungi. It’s important to use fresh garlic – the kind in the jar isn’t as potent as freshly crushed. 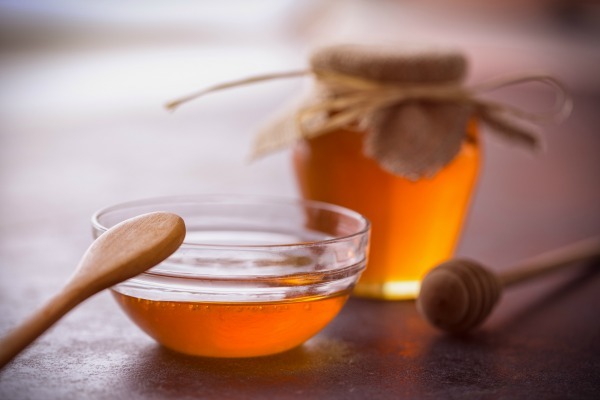 According to Dr. Axe, raw honey has vitamins, 22 amino acids, 27 minerals, 5,000 enzymes,  making it not only a tasty reason to use it in herbal preparations, but a healthy reason as well. Honey that is not raw, however, cannot boast of all of this nutrition. Heating the honey kills beneficial nutrients. In a pinch I would use any honey on hand, but I keep raw honey in my cabinets for regular use. Buy raw honey here. Cayenne is the last herb in this easy formula. Cayenne is a great catalyst herb in any herbal formula, meaning that it opens up your receptors to absorb vital nutrients. In other words, it helps the other herbs work even better than they would on their own. That is exactly what cayenne does in the formula. Plus it really helps the throat to heal quicker. Buy organic cayenne here. Stir in honey and cayenne. Chew 1/2 tsp. every 30-60 minutes, allowing the mixture to coat the throat, and then swallow. Take this mixture at this frequent dose for 24 hours (during waking hours), and then take it every 1-2 hours for at least 2 days more. It’s very important that you take this mixture as indicated to ensure that the strep is actually completely gone. Going to the doctor is vital with using this remedy … one family here in Canada relied exclusively on home remedies to cure their child’s strep throat, and they ended up dying. Good post otherwise! I’ve heard of similar case and have written about it some too. So sad! It’s always good to make sure it’s cleared up at the doctor! Thank you. I always try Herbal remedies first. I home school 4 children in a christian home. We are outdoors a lot so run across situations that we try to remedy with herbs. Look forward to your. E. Book..That’s no you for your help. Auto correct changed my words. Actually, I was searching on Google on this topic and then your website popped up.I have read this article,this is so useful and valuable article. Thanks a lot! !Please keep sharing these type of article.Since long I haven’t read any article like this.